We are a professional carpet cleaning service located in Rockingham, W.A. Carpets however are not all we do; we can take care our your dirty tiles and grout, upholstery, pet odours and general stains. There is really very little we won’t be able to help you with. From rental properties to office buildings we have the team and resources to get the job done right. We take care of everything, our aim is to make the entire cleaning process as simple as possible for you. After contacting us we will arrange a time that suits you best to be at your property to carry out the work. We understand that your time is important to you so we will be punctual, efficient and leave your carpets looking as good as new. Our business may be carpet cleaning but our passion is customer service. We are committed to providing you with the very best customer service this side of the river. We are prompt, efficient and will leave your carpets, tiles or upholstery looking brand new. We pride ourselves with our work and the service we provide to our customers. Our cleaning equipment is powerful and more than capable of removing even the toughest dirt and grim from your carpets, tiles or furniture. With deep penetrating steam jets our cleaning service with go deep and remove the dirt and bacteria hidden within the fabric and fibres. 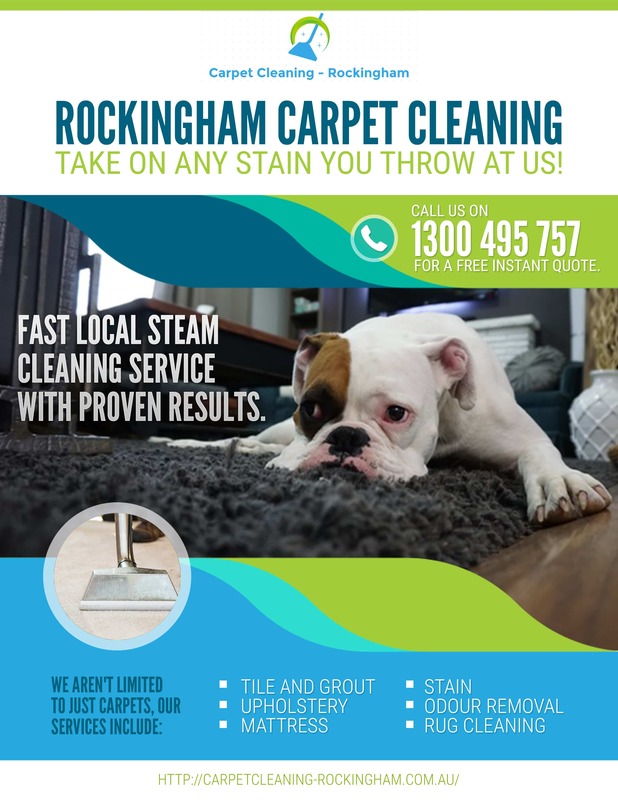 Seeing as though you want to know about us it seems fitting to mention that we are trained professionals when it comes to your carpet.Rockingham Carpet Cleaning have years of experience under our belts and conduct ourselves in a professional and polite manner. Contacting us is easy. Simply fill out the FREE quote for to the right of page or give us a call on 1300 495 757 to speak to one of our team. Don’t leave those stains too late. Let us get on top of them ASAP.